There is nothing wrong with leaving a theatre perplexed. Shakespeare, Ibsen or Chekov may have been storytellers of the highest order, their plays a painstaking work of characters and plots woven together until the strands hang like a medieval tapestry; solid but exquisite. However the 20th century saw the emergence of new writers and new forms; those who use who would use character and language to explore mood and atmosphere. The results of these investigations are equally exquisite but the strands are of gossamer silk and as such one wrong move can destroy their beautiful fragility. 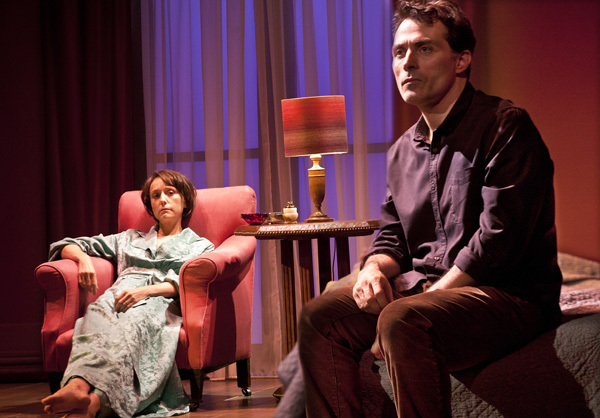 Old Times, written by Pinter in 1971, sits in the middle of his plays that explore ambiguous themes of memory and remembering and that sees characters interrogate their past lives from a present that often appears to exist in a meta-physical hinterland. For his next play, No Mans Land, Pinter would go back to the same ideas again and turn them into the great play of this period of his career. There is nothing particularly wrong about Old Times but if it is a masterpiece, it is one that is in a minor-key. You get the sense of a playwright stretching out, prodding at ideas that require deeper exploration and as a result you get semi-formed fragments that burst fitfully into life as Pinter’s ability to generate unease through the rhythm of language comes to the surface. However there also exist oddities that seem to jar and where his trademark shifts in tone and interruption appear enforced. 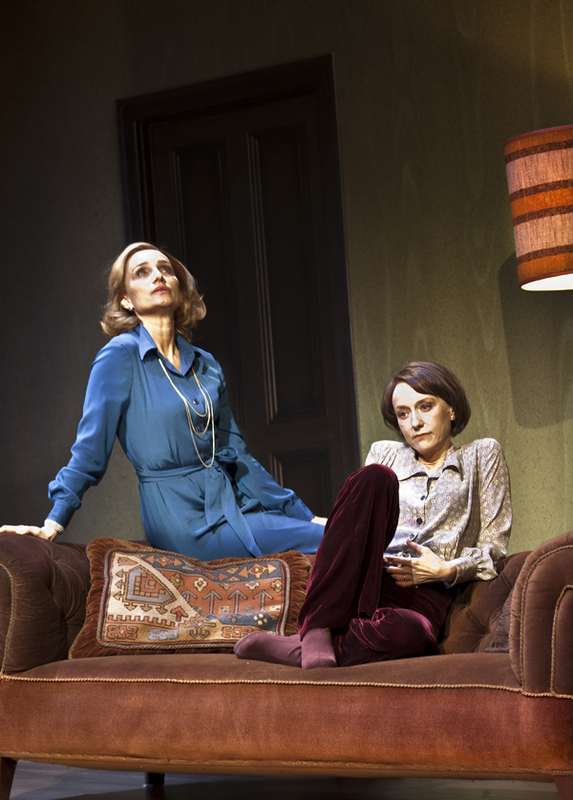 The meaning of the play may be ambiguous but it seems, in Ian Rickson’s decision to alternate the roles of Anna/Kate’s between Kristin Scott Thomas and Lia Williams, that he is following in the interpretation that suggests Anna may be a figment of Kate’s imagination – or even a psychological reference point to an older part of the life that she felt it necessary to ‘kill’ off when marrying Deeley. The key rests in Kate’s monologue, a piece that ties the play together, and so needs thoughtful interpretation by the audience to unlock the secrets of the plot. The sheer sharpness of the change of tone – a moment of genuine, personal agony set against the surface level tensions and insecurities of Rufus Sewell’s Deeley, and Kristin Scott Thomas’ Anna – is beautifully handled by Liam Williams, and hints at why they moved to this quiet, rural community from a life spent in London’s bohemian society. Sewell’s Deely, sat with head in hands, as Kate unveils her unrest, is a powerful image that, as so often with Pinter, challenges the audience to reassess its ideas on the power relationships operating within the play. Anna begins the play onstage, she never actually arrives at their house and, since it is unlike Pinter to fail to imbue any action, any stage direction, with meaning, is clearly signposting the audience to the fact that the surface appearance – a simple plot of ‘old friend visits married couple and unresolved tensions emerge’ – is not all it seems. Ian Rickson has wisely chosen to give the actors the freedom to work with Pinter’s dialogue and it is a spare set that leaves nowhere to hide. Rufus Sewell may have been facing a battle not to lose his voice as the performance went on, leading to some rather unfortunate squeaks as he attempted to forcefully impose his masculine dominance, but inhabited Deeley convincingly, as the outwardly suave but clearly brittle man who must face the loss of former glories. Lia Williams was excellent as a Kate – a difficult role, as it must hold the attention for the majority of the play whilst doing very little. Existing in sharp glances and subtle gestures until the release in her monologue, she must attract and hold the attention of the two more extroverted characters by disappearing into the background, silently but noticeably. Kristin Scott Thomas was perfectly positioned to play the glamorous Anna – slipping into the role like a duck into water – and the only unfortunate element is the fact there is almost something too ‘film-star’ perfect about her; a glistening sheen that made it hard to imagine being an alter-ego for Kate. It would be very interesting to return and see the play again with the roles reversed as it is difficult to see Kristin Scott Thomas, a remarkable actor, being able to fade into the background. Old Times is a fine opening for the newly-renamed Harold Pinter Theatre. It would have been easy to go to an obvious crowd-pleaser like The Birthday Party or The Dumb Waiter but by restaging one of his lesser-known plays they are breathing new life into his back catalogue. It helps us understand how Pinter worked towards his great works, churning out plays enroute that would match the best work from most other playwrights and, as Nobel Laureate and arguable Britain’s most influential 20th century playwright, it is only appropriate that we start to investigate Pinter in the same way that we plumb every aspect of Shakespeare’s life for hidden meaning and new insights.